Good things come in small packages, or so we have been taught. This game, compared to the hefty ones I have been reviewing lately, fits the bill. Easily sent in a mailing envelope, it is nonetheless filled with gaming goodness. 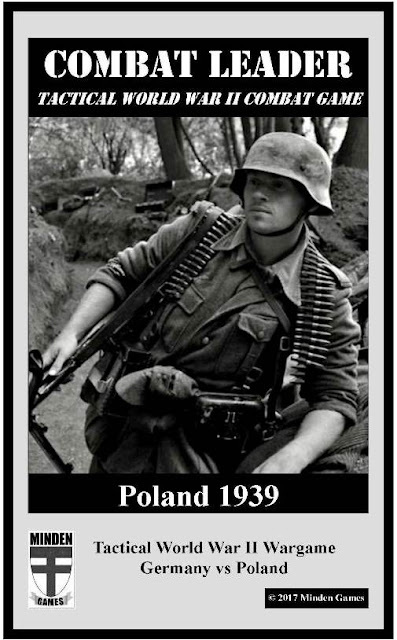 This Minden game is about the 1939 German invasion of Poland. 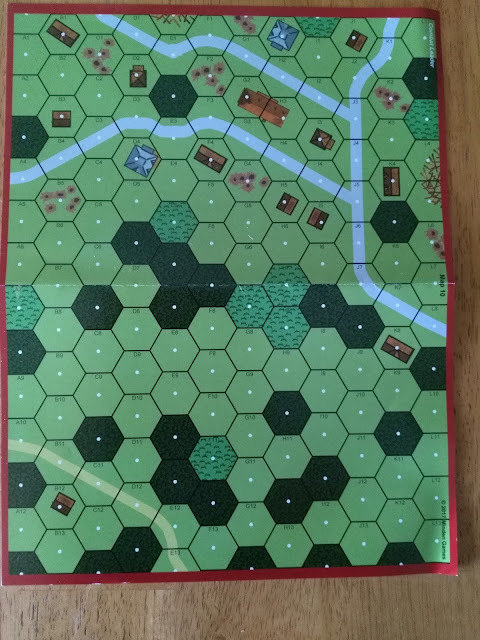 It is a tactical game where each hex is approximately seventeen yards across. Up to twelve friendly units can occupy one hex. 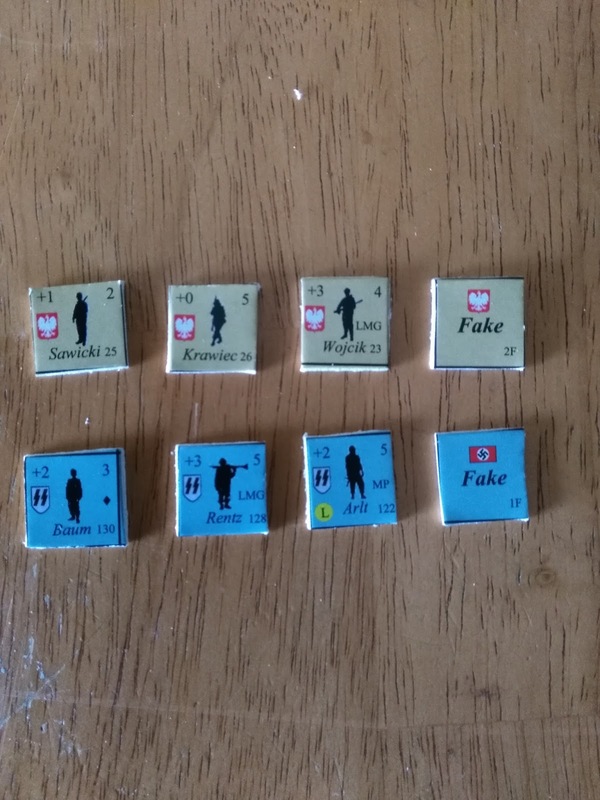 There are 'fake' counters and German SS units. So the game does come with a lot for its small size. 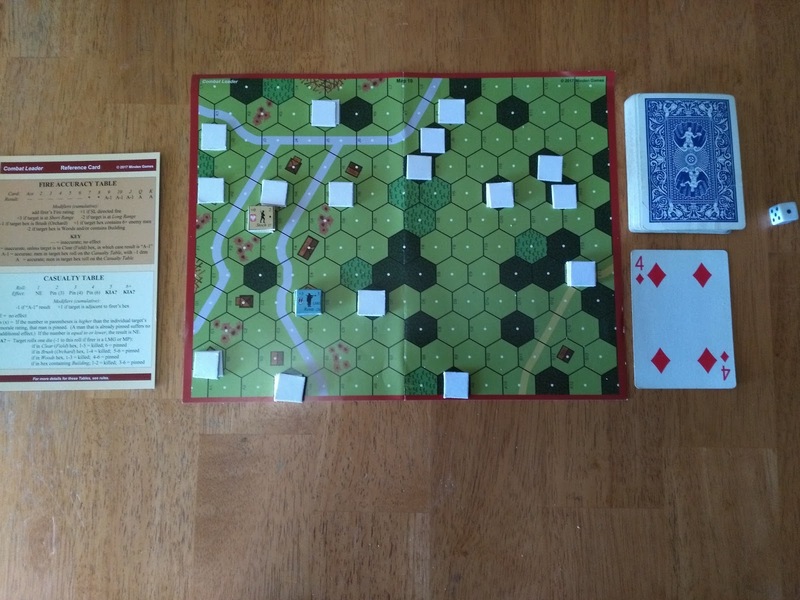 All of Minden games come in a zip lock manner much like a print and play game, with the counter and map being the same thickness. I have two confessions to make. The first is that I am not a fan of print and play games. I guess I just never liked the look and feel of not having a 'real' counter, whatever that means. The second confession is more a foible on my part than anything to do with the game. I decided to make my own counters to use with the game. All went well until it came time for cutting them. I found out that my cutting skills are extremely sub par. So when you look at the pictures of my game's setups, the lopsided counters do not come with the game. The game is a study in minimalism. 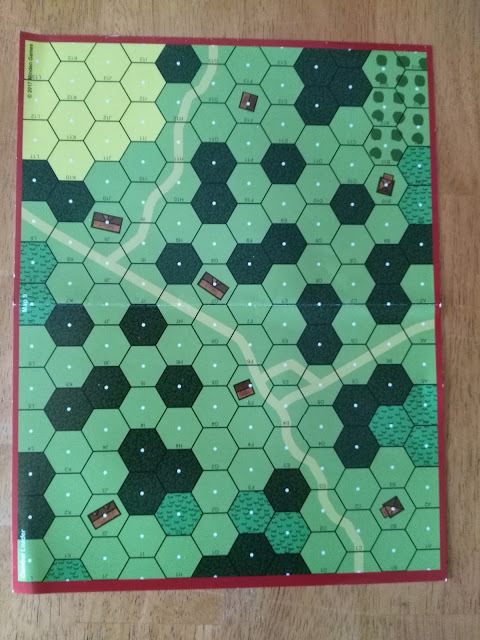 It comes with two map sheets, 8 1/2" x 11", and two counter sheets. It also comes with two small reference cards. The instruction booklet is only twenty-three pages long , with five of these dedicated to scenarios. You need to supply a deck of regular cards and a six sided die to play. Play is like many other tactical games. 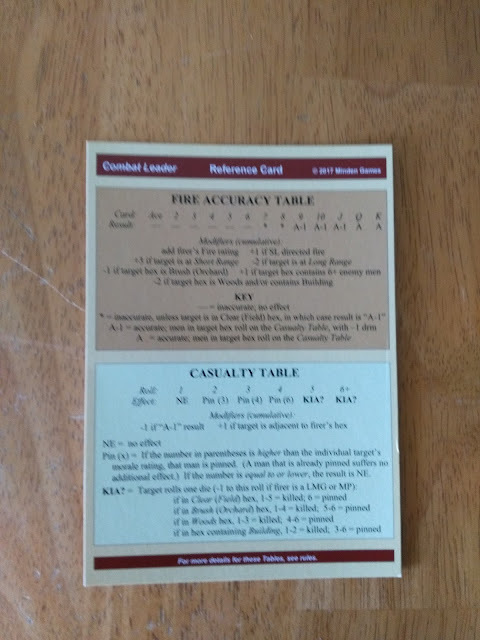 The first player can move or fire one hex of counters, then the second player may do the same. One caveat: the entire hex, no matter how many units are in it, must do the same. So, if you had a hex with six German units and you decided to have them fire, all of the counters in that hex must fire. The initiative phase is actually a die roll check against a table to see if a bonus phase or a rally phase is conducted. The bonus phase is essentially another round of phases one and two, and then another initiative phase. 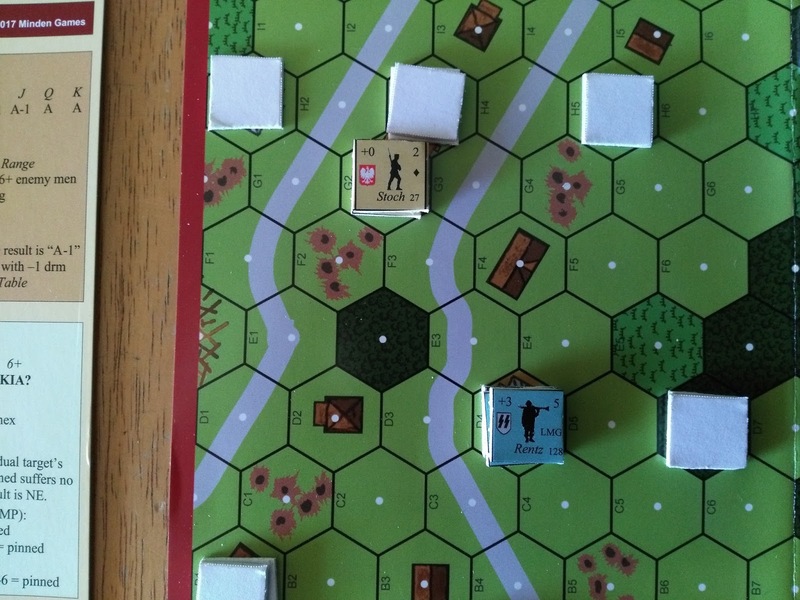 The rally phase is a morale check to see if any units can become unpinned. The phase reverse phase is to see if player one still goes first or becomes player number 2 etc. You start the scenarios with inverted units. 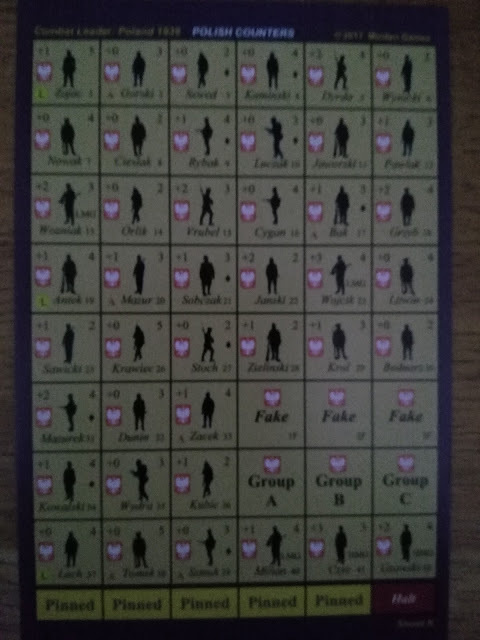 The game also comes with designated 'squad leaders' and 'assistant squad leaders'. These have four movement points if they are face up. All other units have three movement points, unless they are moving with a face up SL or ASL. Once a unit is chosen to move by its owner or is subject to fire etc, it is turned over to its face. The 'fake' counters are then removed. 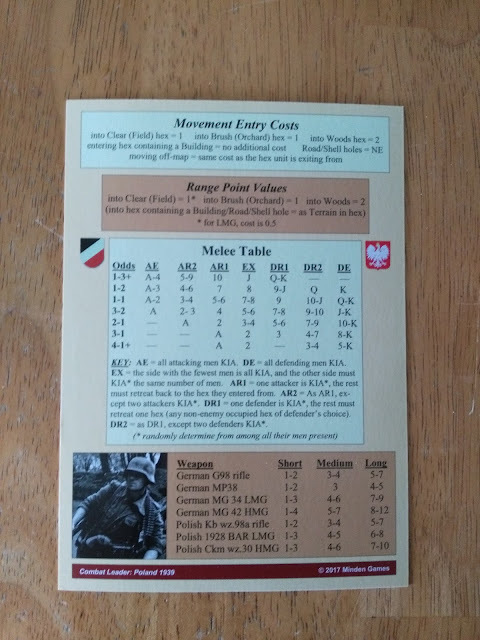 The standard rules take up about eight pages. The advanced optional rules are another five pages. These include additional weapons, group movement, and demolition charges etc. The game is fast paced, and with its small footprint is great for gamers with limited space. Even playing with my distorted home made counters is fun. That is the reason we play, ......correct? I can recommend this game to other gamers, especially those on a budget. These Minden Games would have come in very handy when I was a new father with limited space and even more limited money. With an additional expansion module, and a solitaire module also available, the different games are all around the twenty dollar mark, plus or minus a few dollars. My apologies for the first two somewhat blurry counter pictures. 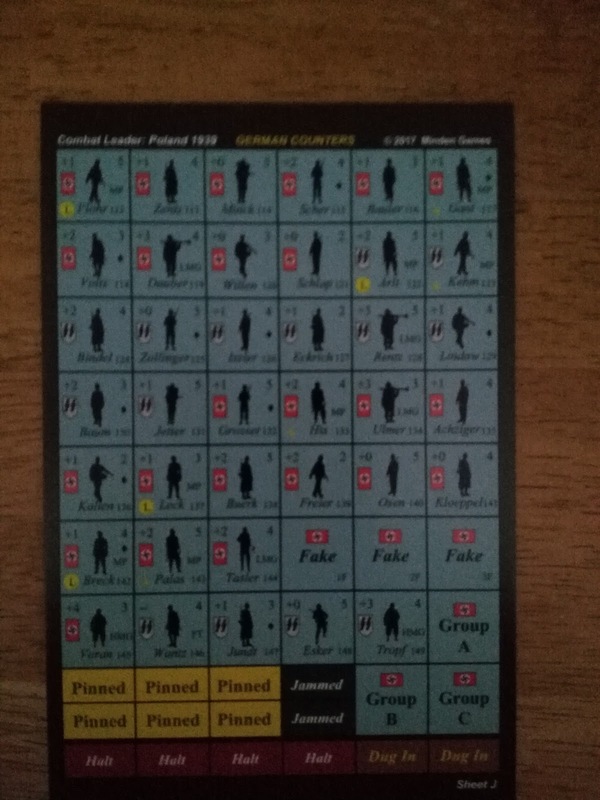 They were the only ones I had left after my decision to finally, after five (almost six) decades of gaming, to try my hand at making my own counters.